Purslane grows abundantly in my herb garden. I'm going to bet that you have it somewhere in your yard, as well. It grows in the hottest of weather without a hint of wilting, while other plants mope with droopy leaves, and in years past I'd pull it constantly for the compost bin. Now I regard purslane as a welcome harvest! Purslane is edible, tasty, and extremely healthy. Easy to snip and collect! According to some research, purslane has the highest amount of omega-3 of any edible plant, and 10-20 times more cancer fighting antioxidants than any other fruit or veggie. It's high in vitamin A, vitamin C, and some B-complex vitamins. The benefits seem to go on and on! As a relatively new forager and weed-eater, the health benefits of purslane stunned me: here I am, working hard to grow healthy veggies and fruits, and this abundant 'weed' has just as many health benefits--in some cases probably more-- than anything I can grow. You better believe that I have started incorporating purslane into my diet! *note: With all of its health benefits, I do want to mention that if you are prone to kidney stones, you may want to avoid eating too much purslane, as it contains high amounts of oxalic acid. Typically a stem of purslane will have offshoots coming from a main stem. I snip the smaller stems to use for eating, and discard the larger stem into the compost. the seeds are perfectly edible, too. 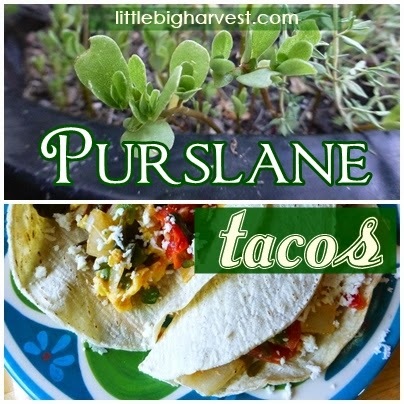 Here are just a few ways purslane is used worldwide: Stirfries, soups, frittatas, smoothies, raw salads, potato salads, tacos. Purslane can be mixed with your basil the next time you make pesto (I already do this with spinach, and will try purslane next time). My current favorite way to eat this unbelievably healthy plant is to make tacos. Verdolagas, Spanish for purslane, is used in several dishes in Mexico, including this tasty meal. I absolutely LOVE these tacos! This recipe makes 4-5 nice sized tacos, great for two people. Double if making for the family. Beat eggs with whisk or fork. Season with salt and pepper. Set aside. Heat large skillet on medium-high heat, add oil. Sauté onion for 1 to 2 minutes until it starts to become translucent. Add purslane; stir to cook for another 2 minutes. Add diced tomato, jalapeno and garlic; sauté about 1 minute to reduce the juice from the fresh tomato. Using a spatula, push the purslane mixture to the sides to make a space to scramble the eggs. Scramble the eggs for another few minutes and mix the eggs and purslane together. Season with salt and pepper. Serve warm with corn tortillas and topped with queso fresco and salsa. I prefer mine without salsa, personally--the taste of these tacos stands great alone! *Tip: While the onion sautes, slice your jalapeno in half lengthwise, remove seeds, and place on a piece of foil under your broiler (skin side up). When the skin starts to blacken, remove and shape the foil up into a small tent with the pepper halves inside. After a few minutes of steaming inside the foil tent, the skins will slide right off the pepper pieces, and then you can dice them for the recipe. Turn broiler off and place your corn tortillas in the oven to warm them while the recipe cooks! Ahhh how I miss Purslane! It is widely available in Turkey and people love it so much we have a cultivated variety. But I always prefer the red stemmed wild variety over that. We mostly cook it as a stew with tomato and wee bit of rice to give texture. My mother also makes a salad mixed with yogurt. Delicious! Nihal, I had heard before that there is a cultivated variety, and I'm thinking of trying to grow it. For now, thought, he wild stuff is all over my place! I will have to try it with a yogurt salad. I'm thinking maybe purslane, cucumber, yogurt and garlic? LOVE this super healthy recipe for using one of my favorite forgeables! Thank you so much for this post. I've pinned it to cook next time we grab a handful of Purslane! This is great! I got a lot growing in my lawn. Now I know what to do with them. Thank you for posting. I hope you enjoy! This is such a nutrition powerhouse, often overlooked as just a lowly weed. Thanks for the comment!